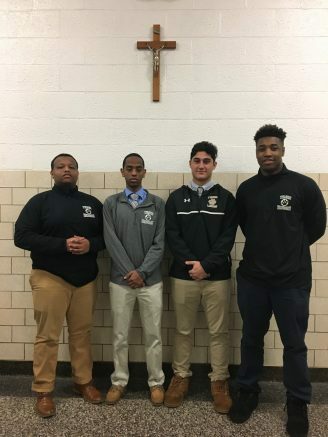 Bishop Timon – St. Jude High School seniors Amanuel Adebe, Luke Issa, Jordan Hill and Elias Aman recently were given the opportunity to attend and participate in Get on Up: The Power of US, an annual Inclusivity Conference for members schools of EdCoWNY (Education Collaborative of Western New York) hosted at Nichols school. The seniors prepared a presentation titled, “A Dream Deferred or Denied,” highlighting DACA (Deferred Action for Childhood Arrivals) relating to immigration laws. Their goal was to draw attention to immigrants coming to the United States illegally and that although that is wrong, humans still have the right of mercy and hope. The students prepared a PowerPoint presentation highlighting the issue of illegal immigrants coming to the United Sates and the impact it has on their children. “Change is hard, and our purpose of the material we presented was to invoke discussion and hear opposing views of the other students in attendance,” Hill commented. “One of the most important topics to address is who is actually caring for the children whose families are affected as illegal immigrants,” Aman noted. In addition to the Timon presenters, the following students also attended: Christian Fischer, Cian Gould, Michael Johnson, Javier Morales, Matt O’Brien, Stephen Reinhardt, Joey Rozeski and Jonathan Stachowski. Be the first to comment on "Bishop Timon seniors present at Inclusivity Conference"